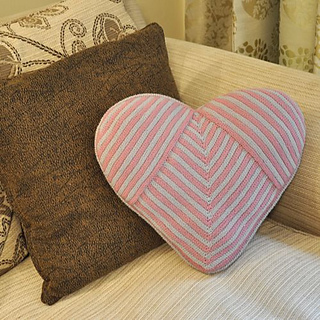 Two Hearts: Large Snikel Bakewell Heart Cushion: Height: 38cms/15", Width: 46cms/18", Mini Bakewell Heart: Height 16.5cms/5", Width: 20.5cms/8"
The Bessie May Snikel Bakewell Heart Cushion is a striking two tone vintage heart design, to cuddle up with, or for accessorising that special place to sit. 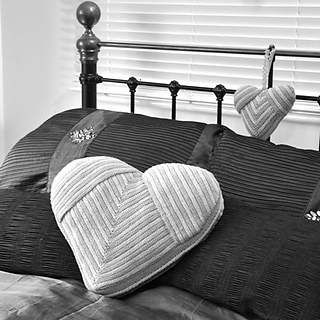 Knitted in Bessie May Snikel in vintage shades, emphasised two tone coloured, textured stripes. 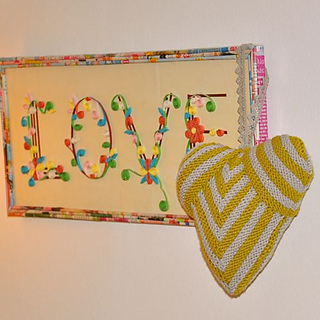 The pattern also includes the pattern for creating a smaller matching Mini Snikel Bakewell Heart design for hanging in that special place. 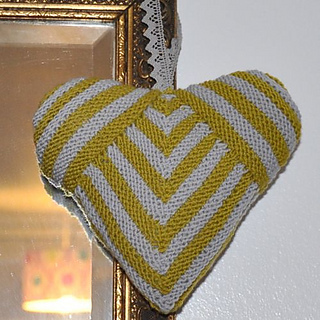 This pattern is intermediate, with the hearts knitted flat, with shaped central diamond, and picked up stitches knitted and shaped to create heart tops.